Buying new equipment every time you take up a new sport can drain you financially. It's tempting to skimp on items such as specialized shoes until you're sure you're going to enjoy the sport. But wearing boxing shoes during training may help you improve your footwork, an important part of boxing. Boxing shoes exist to help you move more quickly; they should feel like a second pair of skin, but with more support. You can find boxing shoes for both men and women. Boxing shoes weigh less than many athletic shoes. This helps boxers move lightly on their feet and change direction and stance frequently, an important part of boxing. Boxing shoes should feel like you're not wearing shoes at all. Most boxing shoes are made of lightweight leather or suede. Boxing shoes often have a thin rubber sole that helps you maintain traction without holding you too firmly to the ground. Shoes with a tread provide traction even if your sweat makes the ring slippery during training. 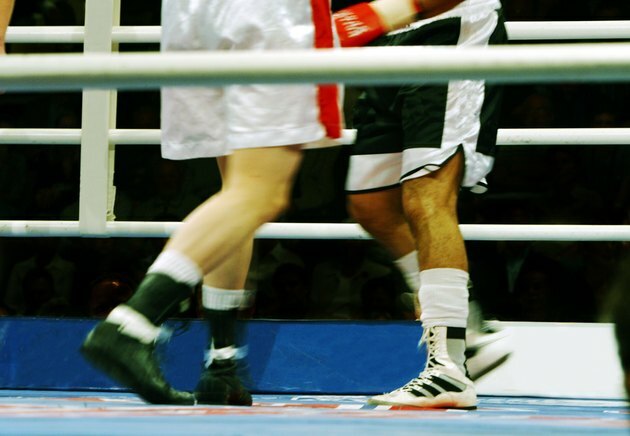 Boxing shoes may not have a built-in arch, like many athletic shoes. Boxing shoes come in both high-top, mid-top and low-top versions. The high-top shoes provide more support and protection to your ankle and lower shins. Some boxers prefer the low-top shoes for workouts, since they provide for greater mobility. Boxing shoes allow sweat to evaporate from the feet because they have permeability, meaning fluid passes through them easily. While this characteristic makes them impractical for use outside, where any water you walk through would penetrate the shoe, it keeps your feet cooler and drier in the ring. Some boxing shoes have mesh windows that improve breathability.